Paleoecological data are integral to ecological and evolutionary analyses. First, they provide an opportunity to study ecological and evolutionary interactions between communities and abiotic environments across time scales. Second, they allow us to study the long-term outcomes of processes that occur infrequently, such as megadroughts, hurricanes, and rapid climate change. Third, the past allows us to study ecological processes in the absence of widespread anthropogenic influence. The R package neotoma, described here, obtains and manipulates data from the NeotomaPaleoecological Database (Neotoma Database: http://www.neotomadb.org). The Neotoma Database is a public-domain searchable repository for multiproxypaleoecological records spanning the past 5 million years. The Neotoma Database provides the data and cyberinfrastructure to study spatiotemporal dynamics of species and communities from the Pliocene to the present; neotoma provides a user interface to enable these studies. neotoma searches the Neotoma Database using terms that can include location, taxon name, or dataset type (e.g., pollen, vertebrate fauna, ostracode) using the Database’s Application Programming Interface (API). The package returns a set of nested metadata associated with the site, including the full assemblage record, geochronological data to enable the rebuilding of age models, dataset metadata (e.g. age range of samples, date of accession into Neotoma, principal investigator), and site metadata (e.g. location, site name and description). neotoma also provides tools to allow cross-site analysis, including the ability to standardize taxonomies using built-in taxonomies derived from the published literature or user-provided taxonomies. We show how key functions in the neotoma package can be used, by reproducing analytic examples from the published literature focusing on Pinus migration following deglaciation and shifts in mammal species distributions during the Pleistocene. Paleoecological data are fundamental to understanding the patterns and drivers of biogeographical, climatic, and evolutionary change, ranging from the recent past to the dawn of life. Although individual site-level studies have provided significant insights into past ecological dynamics, the true power of paleoecological data emerges from networks of data assembled to study broad-scale ecological and evolutionary phenomena allowing us to understand ecological and evolutionary processes and patterns through deep time (Alroy et al., 2008; Barnosky et al., 2011; Raup and Sepkoski, 1984; Sepkoski, 1997), and the rapid and individualistic responses of species to the climate changes accompanying recent glacial-interglacial cycles (Davis, 1981; Graham et al., 1996; Huntley and Webb, 1988; Tzedakis, 1994; Williams et al., 2004). Paleoecoinformatics (Brewer et al., 2012; Uhen et al., 2013) is dedicated to providing tools to researchers across disciplines to access and use large paleoecological datasets spanning thousands of years. These datasets may be used to provide better insight into regional vegetation change (Blarquez, Carcaillet, et al., 2014; Blois et al., 2013), patterns of biomass burning (Marlon et al., 2013), or changing rates of geophysical processes through time (Goring et al., 2012). The increasing interest in uniting ecological and paleoecological data to in order to better understand responses to a rapidly changing world (Behrensmeyer and Miller, 2012; Dietl and Flessa, 2011; Fritz et al., 2013) will require more robust tools to access and synthesize data from the modern and paleo time domains. The Neotoma Paleoecological Database represents a consortium of paleoecological databases spanning the Pliocene to the Holocene (and Anthropocene), with distributed scientific governance and expertise, but sharing a common database infrastructure. Constituent databases include: the European, Latin American, and North American Pollen Databases; the North American Plant Macrofossil Database; FAUNMAP (Pliocene to Quaternary mammal fossils in the United States and Canada); the North Dakota State University Fossil Insect Database; the North American Non-Marine Ostrocode Database (NANODe); and the Diatom Paleolimnology Data Cooperative. More information is available from the Neotoma Working Group webpage (http://www.neotomadb.org/groups). Neotoma is the outgrowth of a longstanding collaboration between the European Pollen Database and the North American Pollen Database (Grimm et al., 2013) and the desire to integrate these data with faunal and other paleo data. The database framework (Grimm, 2008) was generalized from the pollen databases (which had identical structures) and the FAUNMAP database to accomodate both macro- and microfossil data as well as other kinds of data such as geochemical, isotopic, and loss-on-ignition. Work is underway to include other taxonomic groups and depositional contexts (e.g. testate amoeba records, packrat midden data), thus further expanding the data that can be accomodated by Neotoma. Crucially, Neotoma is a vetted database. Through the use of data stewards—domain experts distributed among constituent bases who can check for inaccuracies, upload and manage data records—Neotoma can support quality control assurance for each of the constituent data types, and receive feedback from research communities involved with each specific data type (Grimm et al., 2013). The Neotoma Database has also developed an Application Programming Interface (API) that allows users to query the database via web services, which return data using properly formed URL requests. For example, the URL: http://api.neotomadb.org/v1/data/datasets?siteid=960 will return all dataset information for the record associated with site 960, Guardipee Lake (Barnosky, 1989), originally published by Cathy Whitlock. The analysis of paleoecological data is often performed using the statistical software R (R Core Team, 2014). There are several R packages designed specifically for paleoecological data analysis, including analogue (Simpson, 2007; Simpson and Oksanen, 2014) and rioja (Juggins, 2013) for paleoenvironmental reconstruction, Bchron (Parnell, 2014) for radiocarbon dating and age-depth modeling and paleofire to access and analyse charcoal data (Blarquez, Vannière, et al., 2014). Given the rapid proliferation and availability of these analytical tools in R, the rate-limiting step for analysis has become the difficulty of obtaining and importing data into R. This bottleneck has meant reliance on static datasets that are available as published, and rarely updated, and on more ad hoc methods such as the distribution of individual datasets from author to analyst. With increasing pressure on the ecological community to perform and publish reproducible research that includes numerically reproducible results (Goring et al., 2013, 2012; Reichman et al., 2011; Wolkovich et al., 2012) it is important to provide tools that allow analysts to directly access dynamic datasets, and to provide tools to support reproducible workflows. The rOpenSci project (http://ropensci.org) is dedicated to developing tools that use R to facilitate a culture shift toward reproducible science in the ecology community. As part of this effort, rOpenSci provides a number of tools that can directly interact with APIs to access data from a number of databases including rfishbase for FishBase (Boettiger et al., 2012), and taxize for inter alia the Encyclopedia of Life, iPlant/Taxosaurus (Chamberlain and Szöcs, 2013) among others. The neotoma package was developed in conjunction with rOpenSci and represents one of two rOpenSci packages that interact with paleoecological data along with the paleobioDB package (Varela et al., 2014). 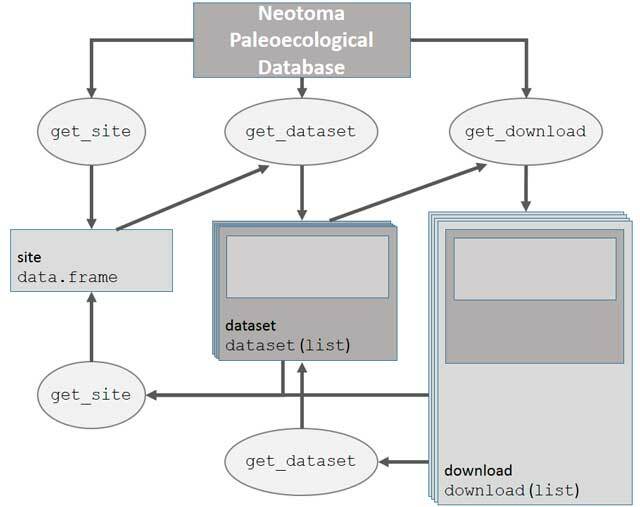 The neotoma package addresses concerns regarding data access and workflow reproducibility by providing users with tools that allow paleoecologists to query, download, organize, and summarize data from the Neotoma database using R. Here we describe the neotoma package, and illustrate its use with examples drawn from the ecological literature, with the general objective of illustrating how neotoma provides tools to perform paleoecological research in an open and reproducible manner. The neotoma R package is an interface between the Neotoma Paleoecological Database (http://neotomadb.org) and statistical tools in R. neotoma uses an API to send data requests to the Neotoma Database, and then forms data objects that are compatible with existing R packages for environmental reconstruction, manipulation, and presentation of paleoecological data such as analogue (Simpson and Oksanen, 2014) and rioja (Juggins, 2013). The neotoma package also includes tools to standardize pollen taxon names across sample sites using a set of published pollen taxonomies for North America, or user defined taxonomies. Data in the neotoma package is represented in three main classes (Figure 1): a “site”, a “dataset” (grouped into a “dataset_list”), and a “download” (grouped into a “download_list”). A “site” is the most basic form of spatial information representing the spatial locations of datasets along with site names, descriptions and a unique site.id. A “site” is a “data.frame” with columns siteid, sitename, lat, long, elev, description, long_acc, and lat_acc. These column headings are generally self explanatory; long_acc and lat_acc are used to indicate the width of the bounding box for a sample site (with a midpoint of long and lat). In the Neotoma Database, examples of sites include a lake from which one or more cores are collected, a cave from which one or more faunal assemblages are collected, an archaeological dig with one or more excavation pits, and so forth. Each unique site returned by the get_site() search is placed in a row, providing enough descriptive data to plot locations and understand the spatial context of a site. Major classes in neotoma, their relations to one another and the associated methods (functions). The classes described below have a heavier outline than their associated variables. The class download contains multiple lists, including dataset, which is a list and defined class. dataset itself contains lists, one of which is also a class, site.neotoma can interact directly with classes through the use of special methods for the various functions described here. These objects and classes are described in more detail below. Although get_site() is useful for first-pass surveys of data availability, analysts more commonly will want to search for and retrieve datasets stored in the Neotoma Database. The function get_dataset() uses search terms almost identical to those used in get_site(), and it returns a more complete description of the datasets available. However, at this time only get_site() has the ability to search for sites based on site names. A “dataset” associated with individual sites can be obtained using get_dataset(). Each search using get_dataset() returns a “dataset_list”, a list of one or more “dataset”s, whose length is equal to the number of datasets returned by the function. get_dataset() returns the metadata associated with a dataset in the Neotoma Database. Neotoma’s datasets are the containers for a set of samples of the same type from a single collection unit within a site. Examples of datasets in Neotoma include 1) all the pollen counts from a single core from a lake, 2) all the geochronological measurements (e.g radiocarbon dates) from a sediment core, 3) all the faunal data from an excavation in a cave, 4) all the plant macrofossil data from a packrat midden. In neotoma, a “dataset” includes the “site” for each “dataset” (as “site.data”, Figure 1), along with the “dataset” specific metadata (“dataset.meta” in Figure 1). The dataset also includes the principal investigator, submission date to Neotoma, and the date that the information was accessed via the Neotoma API using the R package. Each “dataset_list” and “dataset” can be used to access the full “download” using the get_download() method. get_download() returns an object of class “download_list” containing one or more objects of class “download” (Figure 1). get_download() will also return a confirmation message for each individual API call as the function proceeds that can be turned off using the argument verbose = FALSE. Each “download” contains the associated “dataset” (Figure 1). The “sample.meta” component is where the core depth and age information is stored. The actual chronologies are stored in “chronologies”. If a core has a single age model then “chronologies” has a length of one. Some cores have multiple chronologies and these are also included in the “chronologies” list. The default chronology is stored in “sample.meta” and is always the first chronology in “chronologies”. To build a new chronology with the same chronological controls as an existing chronology, perhaps using a different algorithim, get_chroncontrol() can be used to return the chronological controls and the “chronology.id” in either “sample.meta” or any one of the “chronologies” objects. While the chronological controls used to build a chronology may vary across chronologies for a single site, the default model contains the “best” chronological control data, as determined at the time the chronologies for the collection unit were last reviewed. It is important to note, however, that the “best” chronologies for most collection units in the database were based on “classical” age models (Blaauw, 2010) that do not include estimates of uncertainty. Moreover, these default age models that are in calibrated radiocarbon years utilize radiocarbon dates that are calibrated a priori. Bayesian age modeling programs, such as Bacon (Blaauw and Christen, 2011), as well as the classical age modeling program clam (Blaauw, 2010), and return estimates of uncertainty, using uncalibrated radiocarbon dates as input. Thus, the calibrated ages of many existing age models in Neotoma will not be appropriate for these programs, and the age controls may have to be obtained from the geochronology table using get_geochron(). The age controls of existing default radiocarbon-year chronologies may sometimes be appropriate for programs such as Bacon and clam; however, many of these chronologies rejected radiocarbon dates a priori, which could be included when using Bacon. The neotoma package has a function to interface directly with Bacon or clam, called write_agefile(), which will output a correctly formatted age file for either of these applications using a “download” object. The “taxon.list” component lists taxa found in the dataset samples (“counts”) and any laboratory data (“lab.data”), along with the units of measurement and taxonomic grouping (Figure 1). The “counts” are the actual count, presence or percentage data recorded for the dataset. The “lab.data” component contains information about any spike used to determine concentrations, sample quantities and, in some cases, charcoal counts. 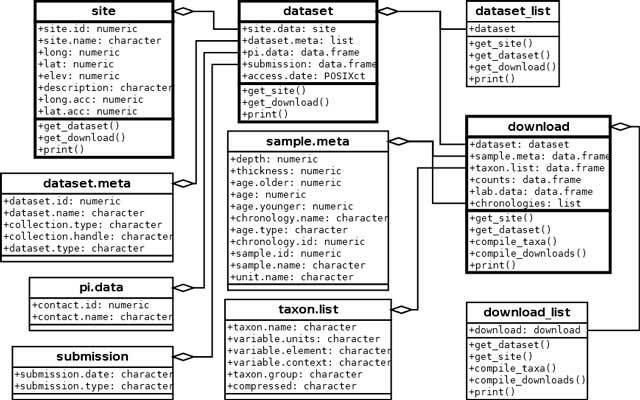 Each of these objects, “site”, “dataset” and “download” can be obtained using direct calls to the API, or using functions defined in the neotoma package (Figure 2). How the main data objects relate to one another in the neotoma package, and the helper functions used to move from one data type to another. Here we present several examples that both introduce users to the neotoma package, and highlight how neotoma can be used in a paleoecological workflow. We begin with a simple example in which we compare change in Alnus pollen between two sites during the late Quaternary, followed by two more involved examples where we look at Pinus migration and changes in late-Quaterary mammal distributions in the United States. The API call was successful, you have returned 1 records. Louise Island. Surrounding vegetation: Tsuga mertensiana, Pinus contorta. In each case get_site() returns a single “site” (Figures 1 & 2). Here we queried the Neotoma database for site based on sitename, but alternately we could have queried for sites within a geographical bounding box, or by geopolitical region. Accessed from 2015–01-19 21:01h to 2015–01-19 21:01h. The dataset ID 8377 is associated with a geochronology object, not count data. get_download will use uniqueidentifiers to resolve the problem. The dataset ID 8356 is associated with a geochronology object, not count data. It is worth noting that it is possible to go directly from a “site” object or set of “site”s to get_download() as well if desired. Pollen taxonomy can vary substantially across cores depending on the level of taxonomic resolution used by a pollen analyst, or as a result of changes to taxonomies over time. One analyst might discriminate subgenera of Pinus, another might simply identify Pinus to the genus level. Gramineae—a common pollen type in earlier pollen records—has now been renamed Poaceae. This variable and shifting taxonomy is a first-order challenge for analysts seeking to analyze the dynamics of taxa across multiple groups. neotoma provides several options for standardized taxonomic list, corresponding to three published taxonomies for the United States and Canada (Gavin et al., 2003; Whitmore et al., 2005; Williams and Shuman, 2008). This function can be helpful, but should be used with care. The aggregation table is accessible using the command data(pollen.equiv) and the function to compile the data is called compile_taxa(). It can accomodate either the internal translation table provided with the package, or a user-defined table with the same structure as pollen.equiv. The taxon.table for Marion Lake now has an extra column (note that several columns were removed to improve readability). compile_taxa() returns a “download_list” or “download”, for which taxon.list gains a column named compressed to link the original taxonomy to the revised taxonomy. This linkage is an important reference for researchers who choose to use this package for large-scale analysis, but who might need to later check the aggregated taxonomic groups against the original data. In this example we see that all the spore types have been lumped into a single taxon Other. Marion Lake (red, Figure 3) maintains much higher proportions of Alnus pollen throughout its history, and has a rapid increase in Alnus pollen during the historical period. This rapid shift in the last 200 years is likely as a result of rapid colonization by pioneer Alnus rubra following forest clearance and fire in the lower mainland of British Columbia (Mathewes, 1973). Plots of Alnus pollen percentages at two sites, one in the lower mainland of British Columbia (Marion Lake, red) and the other on Haida G’waii (Louise Pond, black). Stratigraphic plot for Marion Lake. 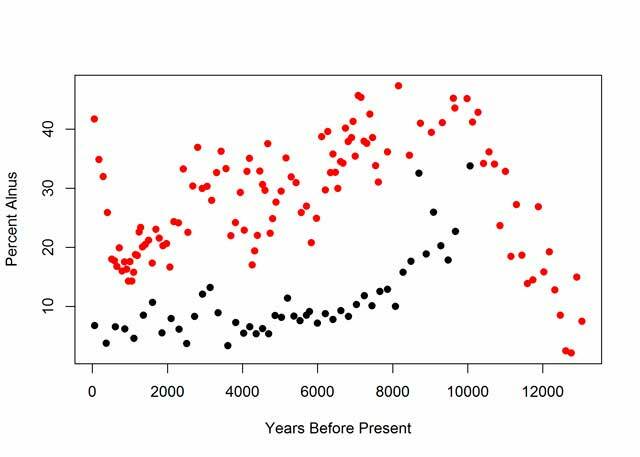 Age is plotted on the y-axis in calibrated radiocarbon years before present. The analogue package provides the opportunity for users to further customize the stratigraphic plot if so desired. Macdonald and Cwynar (1991) used Pinus pollen percentages to map the northward migration of lodgepole pine (Pinus contorta var latifolia) following the retreat of the Laurentide Ice Sheet and the accompanying rise of temperatures in the late-Glacial and early Holocene. In their study a cutoff of 15% Pinus pollen was defined as the indicator of Pinus presence. Strong and Hills (2013) have remapped the migration front using a lower pollen proportion (5%) and more sites. Here, the analysis is partially replicated. Note that additional R packages must be installed and loaded for the following examples. The API call was successful, you have returned 461 records. The map (Figure 5) shows a number of sites in the interior of British Columbia that have no fossil pollen. There are also other sites not shown here that may have relevant data but have yet to be entered into the database. This highlights a common challenge in paleoecoinformatics—the import of individual records into data repositories takes some time and is an on-going process that is aided by the collective contributions of the original analysts, data stewards, and large-scale research initiatives (e.g. PAGES 2K, PalEON). Fortunately, new software tools are speeding up the process of uploading and vetting data. The Tilia software (http://www.neotomadb.org/data/category/tilia) has been updated to allow direct upload to the Neotoma Database and includes a large number of automated data quality checks and standardized look-up tables for variable names. Because neotoma directly links to the Neotoma Database via APIs, analyses using neotoma can be updated continuously as new sites are added. 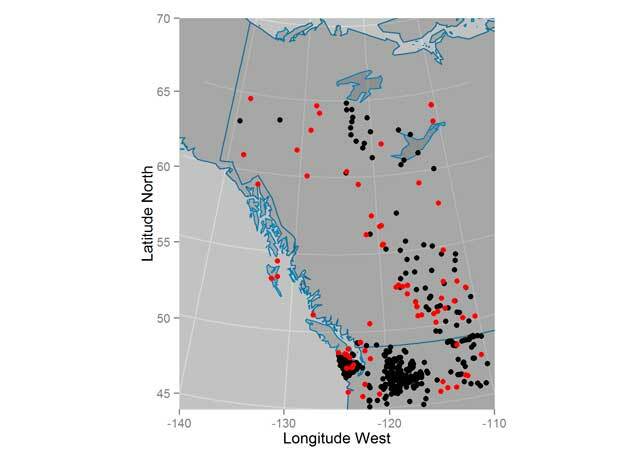 Mapped sites with pollen cores in British Columbia, Alberta and the Yukon Territory of Canada (red), including other Neotoma sites without stratigraphic pollen data (black). #  (since some records have ages in radiocarbon years) for the oldest Pinus. 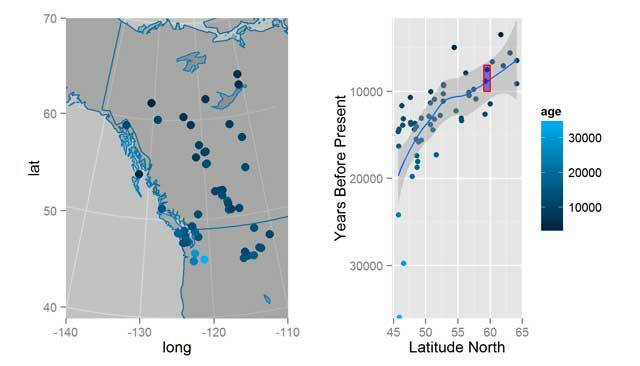 The results show a clear pattern of northward expansion for Pinus in northwestern North America (Figure 6). These results broadly agree with the findings of Strong and Hills (2013) who suggest that Pinus reached a northern extent between 59oN and 60oN at approximately 10–7 ka cal BP as a result of geographic barriers before continuing northward after 7 ka cal BP. Mapped ages of first Pinus establishment in the interior of British Columbia and the Yukon Territory based on a 5% pollen cut-off. The age of first appearance is also plotted and smoothed with a loess curve. Graham et al. (1996) built and applied the FAUNMAP dataset (http://www.ucmp.berkeley.edu/faunmap) of fossil assemblages to elucidate patterns of change in mammal distributions through the Pleistocene to the present. The paper uses various multivariate analyses to show, in part, that mammal species have responded in a Gleasonian manner to climate change since the late-Pleistocene. Graham et al. (1996) show some species migrating northward in response to warming climates, others staying relatively stable, and some moving southward. 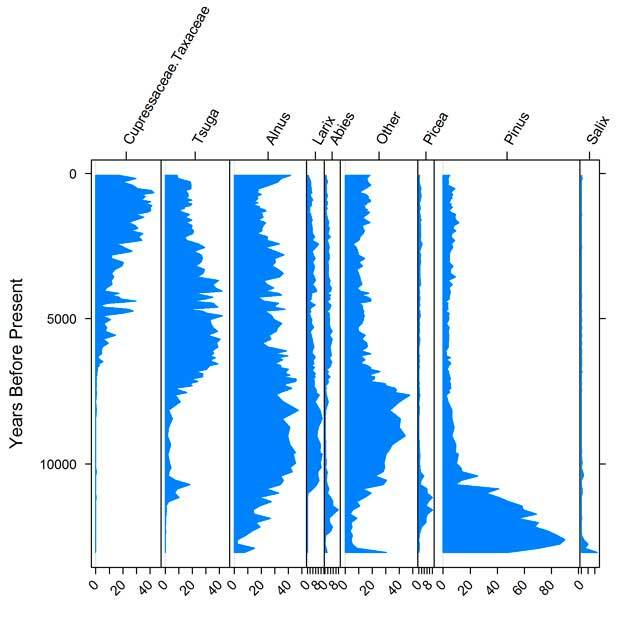 FAUNMAP has been incorporated into Neotoma (and expanded with new records), and this example performs some simple analyses that show how different species responded to the changing climate of the last deglaciation. Sites are assigned to time-period bins as in Graham et al. (1996); Modern (< 0.5 ka cal BP), Late Holocene (0.5–4 ka cal BP), Early-Mid Holocene (4–10 ka cal BP), Late Glacial (10–15 ka cal BP), Full Glacial (15–20 ka cal BP) and Late Pleistocene (> 20 ka cal BP). The first step is to build a large table with time and xy coordinates for each site. Time data in “sample.meta” for the mammal data is not the same as for for pollen where age is commonly found in the sample.meta$age component. Most vertebrate fauna samples are assigned only younger (sample.meta$age.younger) and older (sample.meta$age.older, Figure 1) bounds with no estimates of mean or median age. In this example we average the younger and older ages to determine sample age. We recognize that this averaging of ages is likely to be methodologically indefensible in the scientific literature, but is sufficient for illustrative purposes here. Here we make use of the reshape2 package (Wickham, 2007) to help manipulate data structures. # Group the samples based on the range &direction (N vs S) of migration. # A shift of only 1 degree is considered stationary. Even with this fairly simple set of analyses we see that species did not respond uniformly to climatic warming following deglaciation (Figure 7), consistent with the prior work of Graham et al. (1996). 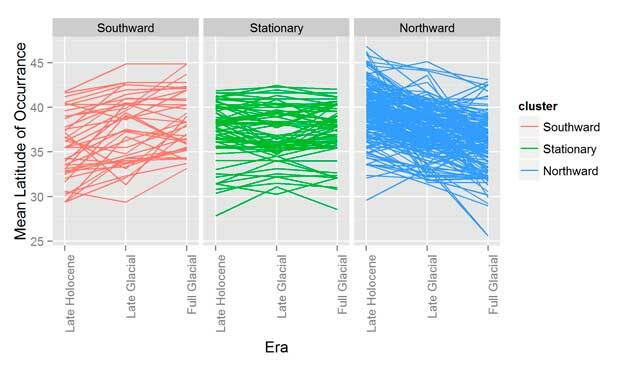 Although most range shifts were northward, a number of taxa show little change in their ranges and a number show southward range shifts (Figure 7). This example does not examine east-west movement and ignores the issues that may be associated with the complex topography of the mountainous west, or possible confounding effects introduced by temporal variations in the available set of sites. The broader point here is that the use of neotoma can support research that is synchronized with the data holdings of large repositories such as Neotoma and reproducible. Mean latitudinal distribution of fossil mammal taxa during the Late Pleistocene show that while there appears to be a net northward migratory pattern, a number of taxa appear not to shift their ranges, or move southward following deglaciation. The whole of the fossil record is much greater than the sum of its parts. Many of our discipline’s most important advances were made possible only by the synthesis of many individual fossil occurrences into regional- to global-scale databases of species occurrences, e.g., the Neotoma Paleoecology Database and the Paleobiological Database. Current frontiers in paleoecological informatics include 1) facilitating the input of data into these databases, 2) improved sophistication of the data models employed by these databases, enabling them to handle increasingly complex arrays of paleobiological and associated geochronological data, and 3) enabling the frictionless integration of these resources with other cyberinfrastructure (Brewer et al., 2012; Committee, 2014; Uhen et al., 2013). Here we present the neotoma package for R and show how it can be used to directly transfer data from the Neotoma Paleoecology Database into the R statistical computing environment. The broader goals of this effort are 1) to ease the transfer of data from Neotoma into an environment widely used for paleoecological analyses (Juggins, 2013; Simpson, 2007; Simpson and Oksanen, 2014) and 2) to enable transparent and reproducible scientific workflows. The neotoma package itself is available either from the CRAN repository, or from GitHub (http://github.com/ropensci/neotoma) where ongoing open-source development continues. Suggestions for improvement and new code contributions by readers and users are welcome. We would like to acknowledge the support of the rOpenSci project and the invaluable efforts made by data contributors across the globe who have provided the platform upon which Neotoma and the neotoma package are built. Brian Bills and Michael Anderson at Penn State University’s Center for Environmental Informatics of provided considerable support in helping us to understand and use the API. This paper is a product of the PalEON project (http://paleonproject.net), funded through the NSF-Macrosystems program grants #1065656, 1241868 and 1241874, and the Neotoma Paleoecology Database, funded by the NSF Geoinformatics program grants #0947459 and #0948652. GLS was supported by the Natural Sciences and Engineering Research Council of Canada (NSERC) Discovery Grant Program (RGPIN 2014–04032). We would also like to thank Lee Hsiang Liow, Pasquale Raia and one anonymous reviewer for their helpful comments. The authors would also like to thank the staff at Ubiquity Press for their considerable efforts in working with the authors to provide a clean layout for the code presented in this paper. Behrensmeyer, A.K. and Miller, J.H. (2012). Building links between ecology and paleontology using taphonomic studies of recent vertebrate communities. Paleontology in Ecology and Conservation, : 69–91, DOI: https://doi.org/10.1007/978-3-642-25038-5_5 Springer. C4P Executive Committee (2014). Paleobiology workshop report, in: EarthCube Collaboration and Cyberinfrastructure for Paleogeosciences (C4P) In: National Science Foundation EarthCube Research Coordination Network: Cyberinfrastructure for Paleogeoscience. Davis, M.B. (1981). Quaternary history and the stability of forest communities. Forest Succession, : 132–153, DOI: https://doi.org/10.1007/978-1-4612-5950-3_10 Springer. Grimm, E., Bradshaw, R., Brewer, S., Flantua, S., Giesecke, T., Lézine, A., Takahara, H. and Williams, J. W. (2013). Databases and their application In: Elias, S. and Mock, C. J. eds. Encyclopaedia of Quaternary Science. Elsevier, pp. 831–838. R Core Team (2014). R: A language and environment for statistical computing In: Vienna, Austria: R Foundation for Statistical Computing. Sepkoski, J.J. (1997). Biodiversity: past, present, and future. Journal of Paleontology, : 533–539. Simpson, G.L. (2007). Analogue methods in palaeoecology: Using the analogue package. Journal of Statistical Software 22: 1–29. Uhen, M.D., Barnosky, A.D., Bills, B., Blois, J., Carrano, M.T., Carrasco, M.A., Erickson, G.M., Eronen, J.T., Fortelius, M., Graham, R.W., Grimm, E.C., O’Leary, M.A., Mast, A., Piel, W.H., Pollyn, P.D. and Säiläg, L.K. (2013). From card catalogs to computers: databases in vertebrate paleontology. Journal of Vertebrate Paleontology 33: 13–28, DOI: https://doi.org/10.1080/02724634.2012.716114 others. Whitmore, J., Gajewski, K., Sawada, M., Williams, J., Shuman, B., Bartlein, P., Minckley, T., Viau, A., Webb, T. III, Shafer, S., Anderson, P. and Brubaker, L. (2005). Modern pollen data from North America and Greenland for multi-scale paleoenvironmental applications. Quaternary Science Reviews 24: 1828–1848, DOI: https://doi.org/10.1016/j.quascirev.2005.03.005 others. Wickham, H. (2007). Reshaping data with the reshape package. Journal of Statistical Software 21: 1–20.